Many are still deeply mourning the loss of Star Wars icon Carrie Fisher, who has appeared in four live-action movies as Princess Leia. There have been a number of tributes and vigils held for the fallen star. And now, some fans are taking it even further. 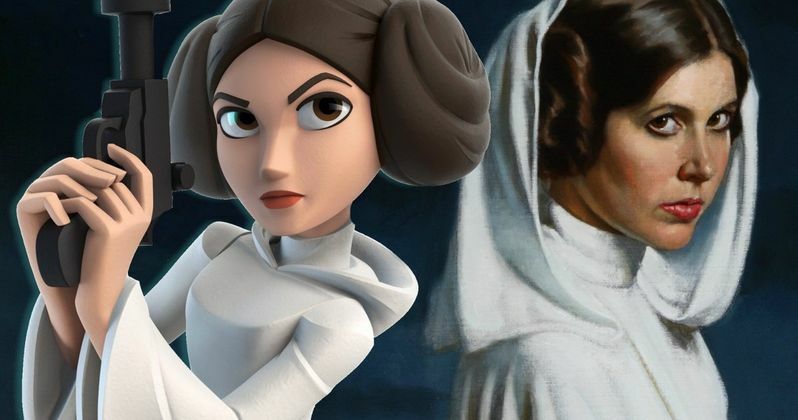 A petition has been launched to make Princess Leia an official Disney Princess. the surprising thing is that this hasn't already happened. Following Carrie Fisher's untimely passing at the all too young age of just 60, a group of Star Wars fans mobilized to launch a petition online. You can read the entire thing, and sign it as well, by visiting change.org. Here's what the petition says. "After the tragic lose of Carrie Fisher, we feel that it is only fitting for Disney to do away with the rule that an official Disney princess must be animated and make Leia a full-fledged princess. This would be a wonderful way to remember Carrie and a welcoming to one of Disney's new properties that is beloved by millions. What we are asking is that the Walt Disney Corporation hold a full ceremony inducting Leia as the newest Disney princess as well as a special service in memory of Carrie Fisher." As of now, the petition has gained 43,148 supporters with 6,852 needed to reach 50,000. Way back in 2012, Disney purchased Lucasfilm, paving the way for a new trilogy based on the Skywalker family, which kicked off in 2015 with The Force Awakes, as well as a series of standalone Anthology movies, the first of which arrived just a few weeks ago, with Rogue One bringing Princess Leia back for a quick cameo. Disney does own Princess Leia, and could make her an official Disney Princess if they so wanted to. The Disney Princesses are actually a hot commodity for Disney, and include such iconic names as Snow White, Cinderella, Sleeping Beauty, Mulan and Princess Tiana. But as noted, Disney's princesses are all animated and its a rule they refuse to break. Perhaps they could circumvent this rule, seeing as how a young Princess Leia has shown up in animated form in Star Wars Rebels. It's not hard to make the case for Leia being an official Disney Princess. She is strong, fights for freedom, has never shied away from a fight, and is better with a blaster than most of her Star Wars male counterparts and every single Stormtrooper combined. Then there is the small fact that she is already a princess. Before Carrie Fisher's death, though, some fans were worried that Princess Leia would actually become, what at the time was being considered, a 'dreadful' Disney Princess, with one enterprising Youtube user posting a video that lays out all the reasons why Leia shouldn't be inducted into this club. The biggest reason is that she is played by an actress and not a cartoon. Fact. Amy Adams' Enchanted character Giselle was excluded from the Disney Princess club because she, too, was portrayed by a human actor. But now some fans, in both the Disney and Star Wars camps, think it's time for Disney to break the rules. You can head over to change.org right now to sign up and help get Leia into the club.